Who were the Druids? What do we know about them? Do they still exist today?The Druids first came into focus in Western Europe - Gaul, Britain, and Ireland - in the second century BC. They are a popular subject; they have been known and discussed for over 2,000 years and few figures flit so elusively through history. 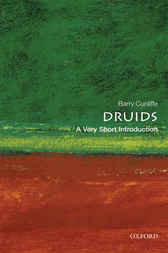 They are enigmatic and puzzling, partly because of the lack of knowledge about them has resulted in a wide spectrum of interpretations.Barry Cunliffe takes the reader through the evidence relating to the Druids, trying to decide what can be said and what can't be said about them. He examines why the nature of the druid caste changed quite dramatically over time, and how successive generations have interpreted the phenomenon in very different ways.ABOUT THE SERIES: The Very Short Introductions series from Oxford University Press contains hundreds of titles in almost every subject area. These pocket-sized books are the perfect way to get ahead in a new subject quickly. Our expert authors combine facts, analysis, perspective, new ideas, and enthusiasm to make interesting and challenging topics highly readable. Professor Barry Cunliffe is Emeritus Professor of European Archaeology at Oxford. He is the Commissioner of English Heritage and has been a Trustee of the British Museum, Governer of Museum of London, and President of the Society of Antiquaries. His previous publications include The Celts: A Very Short Introduction (1997) and Facing the Ocean (2001).